Ten years after the first iFM conference in York, the 2009 edition will take place in Düsseldorf, Germany, alongside the river Rhine. Hosted by the University of Düsseldorf the conference will be jointly organized by the software engineering group of Düsseldorf University and the formal methods group of the University of Paderborn. The conference is co-located with the Workshop on Integration of Model-based Methods and Tools and a Workshop of the Working Group on Formal Methods for SOA and Internet of the Future. Düsseldorf is quite convenient to reach as it has an international airport with direct connections to numerous cities. Düsseldorf Central Station (Hauptbahnhof) is frequented by a regular train service throughout Germany since it is situated on the main north/south route between Munich, Frankfurt, Cologne, Dortmund, Hamburg. High speed trains (ICE, EC and IC) as well as regional trains will stop here. For rail travel information please visit the following website: www.bahn.de and enter as your destination Düsseldorf Hauptbahnhof. Paris can also be reached using the Thalys train service from Köln (Cologne). The FFFZ is located 3 km north to the city centre, in an area called Stockum close to the river Rhine and the Trade Fair Center. 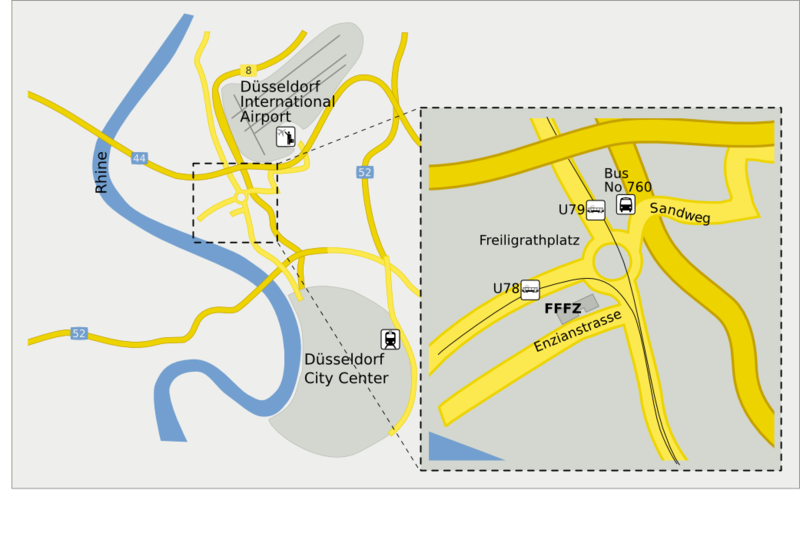 The conference venue is directly accessible via the motorway A44, exit Düsseldorf-Stockum. Free parking is available directly at the FFFZ or on the Kaiserswerther Strasse. The city centre and the conference venue can be easily and quickly reached from the airport or the central station by bus and tram. When coming from the airport you can take bus No 760 at Terminal A/B/C, outside the arrival hall, heading to Roßpfad and get off at Freiligrathplatz (approx. 7 minutes). To reach the city you can use the S-Bahn. With line S7 it takes only 12 minutes to get to the Düsseldorf Central Station. From the Düsseldorf Central Station or the city centre, subway trains U78 and U79 (direction: LTU-Arena/Messe Nord or Duisburg) will get you to the conference venue. You will have to leave the tram at Freiligrathplatz. Tickts are available from the ticket machines, from Rheinbahn's customer centres and from many sales partners. Single Tickets or 4-Trip Tickets can also be bought from the bus driver; in trams you can find ticket machines. It is not possible to buy a ticket in the S-Bahn, so be sure you have one before entering an S-Bahn. Most tickets have to be stamped before you commence your journey (the single tickets are usually already stamped). For timetables and further information please refer to: www.vrr.de or www.rheinbahn.com.